Having watched TFA and TLJ a few times, I noticed that the only non-BB astromech droid we see is R2-D2, and he spends most of both of those movies in low-power mode and looking fairly worn out. Are R-series astromech droids obsolete technology by the time of TFA? Is there any other explanation for why we see many R-series droids in the first six movies, but only BB units after that? As of TFA, R2-D2 is at least 65 years old (as he was fully operational in TPM, which was 65 years before TFA), but that doesn't fully explain why there would not be more recently built R-units around, or why a 65-year-old droid would necessarily be considered obsolete. Do we simply see no other R-series droid because they are truly considered obsolete tech that no one, Resistance, First Order, or other, would use unless they had no other choice (or were guided by sentimental reasons), or is this simply an artifact of the fact that the story is concentrated among small groups of people and places and the absence of an otherwise common R-unit is simply by random chance? There are multiple R-series units in the foreground of this shot from The Force Awakens. It would appear that they're not obsolete, at least within the structure of the Resistance (which appears to be somewhat underfunded, but possesses some relatively new kit). With its emphasis on starfighters and other small space transports, the Resistance has a higher proportional need for astromechs than does its First Order enemy. 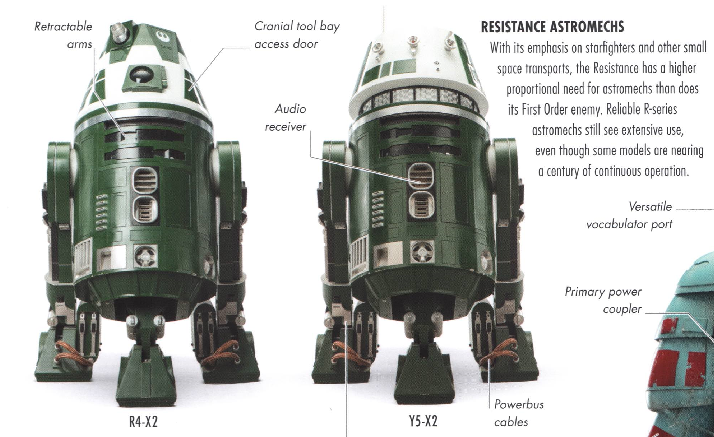 Reliable R-series astromechs still see extensive use, even though some models are nearing a century of continuous operation. Not the answer you're looking for? Browse other questions tagged star-wars the-force-awakens technology the-last-jedi droids or ask your own question. Is this the same droid in two scenes from the Force Awakens? Do the different colors of the R2 units denote any specific differences? How many R2 droid units were there according to canon? Are C3PO and R2D2 different from normal Star Wars Droids? What tools have Astromech droids demonstrated in canon? Can astromech droids control and fly the ships they're mounted in? What does an astromech droid actually do while deployed in combat? Why did the Lars family need an astromech droid? What is the difference between a TC-series and C-series protocol droid?